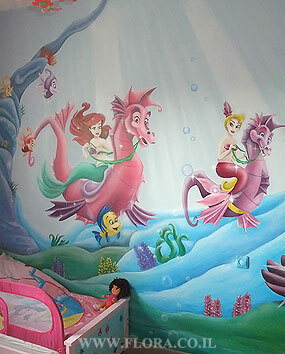 Baby room murals.The Little Mermaid Ariel`s Undersea Adventure. Mermaid Ariel on walrus. Sun rays caressing her hair. Shell and pearl in it. Flounder and other residents of the Underwater Kingdom swimming alongside. Ashdod. Wall paint drawing size 3 meter. Painter Flora.